We provide a variety of services and facilities that support your business. If you are coming to Fukuyama for your business, choose to stay at the Fukuyama Oriental Hotel – we have great access to the neighboring areas. Our various excellent services will help you complete your work efficiently throughout your stay at our hotel. 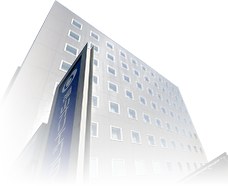 Our great location – within a two-minute walk from JR Fukuyama Station – helps your business go smoothly. Each guest room has a simple modern interior (both single and double types) and a comfortable desk that helps you concentrate on your work. A number of convenient and attentive services are available, including free Wi-Fi access, free coffee machines on each floor and newspapers! Everything you need for your office work is available in your room. If you bring a laptop, it instantly becomes your office! We have selected an office chair in our guest rooms that helps reduce your fatigue from working long hours. It has a backrest, so you can easily have a quick break. Your cellphone can be charged with a USB Battery Charger that is available at our hotel. Other types of battery chargers are also available. Feel free to help yourself. Free Wi-Fi is available throughout our building. You will have no problem working online. It is an easy connection as no password is required! Have a break and refresh when you feel tired. In addition to a great buffet breakfast and spacious bath, we offer various services (listed below) to help you refresh from work and feel comfortable during your stay. An air conditioner is installed in each guest room, so you can adjust the temperature, as you like. Set a comfortable room temperature just for yourself with the remote control. More than 120 programs and movies are featured on V.O.D. A flat screen TV on the wall in your room allows you to have an access to Video on Demand (VOD) that features more than 120 programs and movies at anytime you like (subject to extra fee). Each floor has a coffee machine (“Barista”) that serves delicious coffee free of charge. You can also find vending machines with alcoholic beverages on the second and third floors.